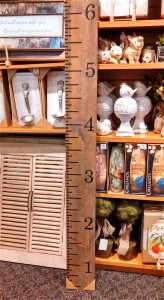 YOUR KIDS GROWTH CHART AS ART - Decor Designs, Inc.
Recording your kid’s height and date on a wall or door trim can be a fun, ongoing project for the whole family. But what happens when it’s time to paint or redecorate? I recently ran across what I think could be a pretty awesome win-win for this issue. Kirkland’s Home is currently selling a piece of art that looks like a large scale ruler. This 6 foot by 7.25″ ruler is the perfect solution for recording your children’s growth over the years because it gives you the added flexibility of moving it when the need arises. Imagine neatly transferring all the markings from your wall to this ruler. Now you can repaint the wall or trim any way you want and your records are intact for the life of your kids. Of course, if you’re a crafter, you can make your own board for a fraction of the cost. But for those of us that prefer instant gratification, this is definitely a winner. This entry was posted in Decorating Tips, Interior Decorating on April 15, 2014 by Jeff Rice.